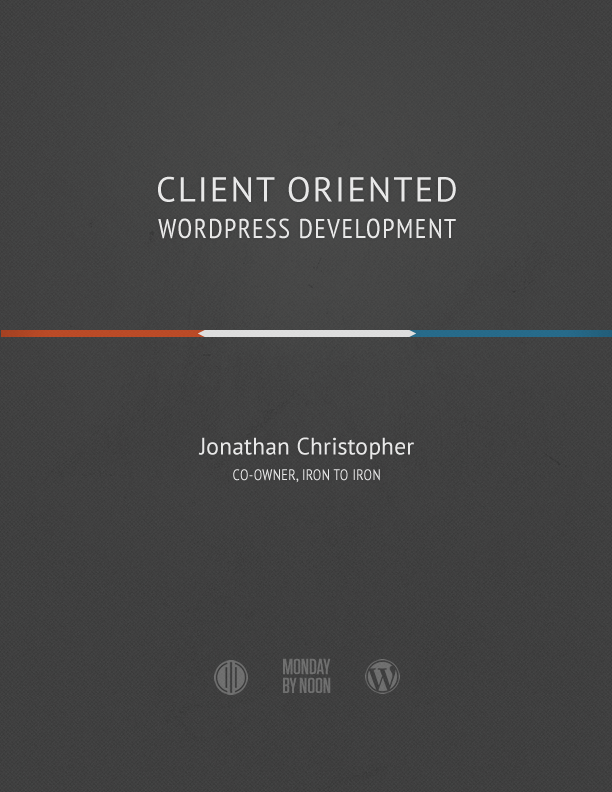 A few weeks ago I got my hands on the latest WordPress book to hit the (electronic) shelves, Client Oriented WordPress Development by Jonathan Christopher. I’ve been following Jonathan’s blog Monday by Noon for a couple of years now, and have grown to expect top notch quality in his writings. The book does not disappoint and it’s definitely the best WordPress book I’ve read this year. Jonathan however takes a completely new angle, and gives his views on an uber-valuable area of WordPress development, that of building websites for your clients. So many of us WordPress developers are daily working with clients in order to build new WordPress sites for them, and we may or may not have a proper process in place for such work. This book goes through the whole process from project planning and filtering clients, up to implementation details and tips for WordPress. I’ve realised that many of the informal processes I use with my team are also used by Jonathan, however I also picked up a few tips along the way, which I will definitely include in the next projects. Another bonus is that when you buy the book you will also get access to a discussion forum, where the chapter’s contents can be discussed with the author directly and with other WordPress developers who have bought the book. I like this idea from a business point of view too. It would be cool for other WordPress experts to publish a book about a particular topic and then build a community through forums. I can think of WordPress SEO and Hosting/Server Setups as two other possible niches. The full book is 160 pages long and is available in DRM-free ePub (iBooks), PDF, and Kindle formats. Each purchase can be used by the purchaser on any number of devices. Jonathan is offering a free one chapter sample on the site, for anyone who would like to take a sneak peek. For the price of $13.99, I really recommend that you go out and get this book if you’re a WordPress developer. You will certainly pick up a few tips that will help you polish your own process. 5 Free Copies Up For Grabs! Jonathan has kindly offered 5 free copies to the readers of WPMayor. Claiming your copy is easy. Just tweet about this post and leave a comment telling us why you would like to have this book. The 5 winners will then be chosen randomly. Here are some good resources and tutorials dealing with the subject of Object Oriented WordPress plugin development. Japheth Thomson presented on WordPress as a development platform at WordCamp Melbourne. You can check him out on his website and on Twitter at @japh. Hi Jean, I’m definitely interested in learning more about WordPress, still fairly new to the WordPress community. This book will definitely be very helpful, hopefully I’ll win a copy of the book. I would love to get a copy of the book. Not only do I develop WordPress sites for clients, I am involved as a team lead in a company that does the same. 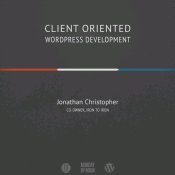 A book like this is sure, to help me refine my process and approach to clients/WordPress. I’m pretty much a newbie to WordPress. My overall goal is to help small businesses realize the potential that WP can bring them. This book looks like it would be perfect to help me start this journey. Looking forward to reading for sure. What a great idea for a book, thinking of what you and your clients can bring (or not) to each others is a nice curve to use WordPress. What i will do with such a book, learn, learn and always learn and put in practice. When will the winners be chosen? Will be announced on Friday. It would be nice to have a book like this to help my startup create plans and methods for our clients directly centered around the WordPress platform. Thanks for the giveaway and thanks to the author for offering the books for the giveaway.